Why antacids do not work to reduce gas and bloating. We have been conditioned to believe that gas and bloating are alleviated by taking antacids or heartburn remedies. For most people the opposite is true. All antacids can do for you is reduce the acid (increase the PH level) of the stomach, they cannot reduce gas in the stomach or the intestines or in the colon, nor can they improve digestion. Conversely, probiotics and more so, digestive enzymes (even better the combination of both) can vastly improve digestion throughout the entire digestive system, eliminating or greatly reducing gas pain and bloating. Why are antacids so popular? The active ingredients in antacids like Tums®, Rolaids®, Maalox®, etc. are very inexpensive and abundant minerals such as aluminum hydroxide, magnesium carbonate, aluminum hydroxide, calcium carbonate or magnesium hydroxide or a mixture of these minerals. Cheap ingredients make the antacid manufacturing and selling industry very profitable. Plant based digestive enzymes however are expensive to produce. They must be extracted from fruits or grown and harvested, then carefully mixed to exacting specifications. You can lower your stomach acid (not gas) by taking antacids but they do not reduce gas or bloating (but they can actually increase it). Over the counter antacids like TUMS® create a chemical reaction with stomach acid (Hydrochloric acid) that can produce carbon dioxide gas. You hardly want to create a situation that produces gas if you are already bloated and uncomfortable with gas. How can antacids actually harm your digestive process? The stomach is an acid environment; antacids are very high alkalines which are at the opposite end of the PH chart. No area of the human body is supposed to be at or can thrive in a high alkaline PH level. The separate areas of the stomach, small intestine and colon need specific PH levels in order to digest food properly, combat bad bacteria and germs, absorb nutrients and discourage yeast growth. A PH chart ranges from PH 1-14, a low number is acidic, a high PH number is alkaline, while 7 is neutral (neither acid nor alkaline). When you start to change the natural PH level of your body with antacids you may feel a small temporary relief but unless you truly do have too much stomach acid, you could be making matters worse for yourself in the long run and could be causing a host of problems throughout your body. Antacid use can lower the acidity of the stomach to such a degree that our food sits in the stomach longer than it should and prevents proper breakdown of the food. Food lingering in your stomach which is now too low in acid (thanks to antacids) is consumed by bacteria and yeast that are still alive because the acid level is too low; this consumption produces gas and bloating. The bloating and gas increase pressure on the lower esophageal sphincter (B in the illustration below) which is supposed to keep stomach acid from traveling up the Esophagus (A in the illustration below) and causing acid reflux, GERD or heartburn. When the pressure gets too high the acid can leak out. Some digestive enzymes need a high acid environment to work, so antacids can also render enzymes less effective. No-Bloat™ has enzymes that function best in different PH areas. Some work in the low PH acidity of the stomach while others need the near neutral PH of the small intestine to function best. This combination of too low acid levels and reduced enzyme effectiveness causes food that is not sufficiently digested to be dumped into the intestines. Now your intestines have an over-burden placed upon it and the gas and bloating can continue to increase. Food is supposed to be completely broken down and digested into waste by the time it reaches the colon (which removes the water from the waste). Poor digestion can lead to food entering the colon which is not fully broken down. This food then can continue to feed unhealthy populations of bacteria and/or Candida yeast, producing even more painful, gassy bloat. If the Ph environment is not acidic enough the bad bacteria and yeast can really thrive and cause havoc on your system. Your stomach responds to antacids raising the PH level by producing more acid in an effort to bring the PH level back down to where it needs to be for proper digestion. 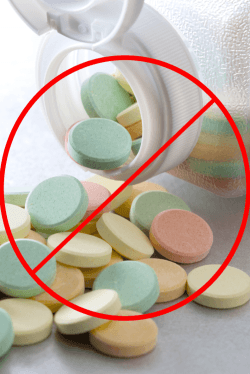 Taking more antacids can cause the cells in the stomach lining that produce this acid to become fatigued and unable to produce enough acid resulting in a gas and bloat producing stomach environment. To the right (or above on mobile devices) you see an illustration of the digestive system. The red letters A through H mark key areas of the digestion process. Stomach acid (C) has a pH value of 1-2 which is very acidic, like that of battery acid. After the acid and enzymes in your stomach break down your food into a substance called chyme, it passes thru the Pyloric Sphincter (D) into the Duodenum (E) which is the first section of the small intestine. Your body increases the PH level inside the Duodenum to a slightly acid level of PH6 and digestion continues. The mostly digested food then passes into the middle portion of the small intestines the Jejunum (F) with a PH of approx. 7, where most nutrient absorption occurs. Digestion and nutrient absorption should be completed in the Ileum (G) portion of the small intestine before it passes as waste into the colon (H). The body lowers the PH of the colon environment back to a slightly acidic level of 6-6.5PH. This acidic level is very important in preventing over population of bad bacteria and yeast overgrowths. If the PH level inside the colon becomes too alkaline bad bacteria can take over from the acid loving bacteria that are supposed to be in the colon. Many of the beneficial bacteria that we take as supplements actually produce small amounts of Lactic acid. These lactic acid bacteria (LAB) help lower the PH in the colon to the slightly acid levels it needs for healthy, bloat and gas free functioning. SciTrition’s Probiotic Mega Blend™ contains 4 different lactic acid producing friendly organisms. Candida yeast also thrives in an alkaline environment and an overgrowth of Candida can itself raise PH level in the intestine and colon to unhealthy levels. This is why lactic acid producing friendly organisms are used to combat yeast infections. * This information applies to people with normal stomach acid, some people do produce too much stomach acid and much of the information on this site does not apply to them. Tums® is a registered trademark of GlaxoSmithKline. Rolaids® is a registered trademark of McNeil-PPC. Maalox® is a registered trademark of Novartis.